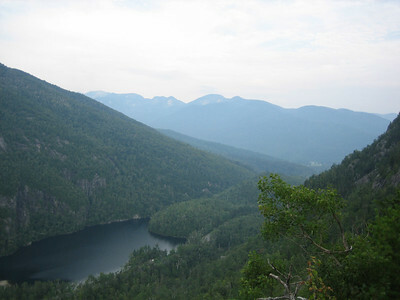 Hiked up Giant Mountain in the Adirondacks on a hazy day - not so good for photos. Hiked up Giant Mtn. 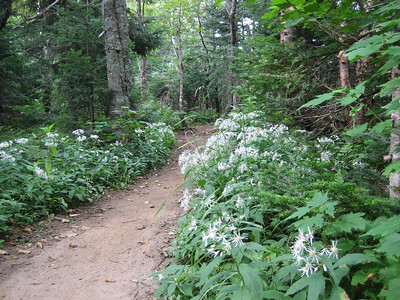 via the Zander Scott/Ridge Trail. 6.0mi round trip and 3,050' of vertical gain. 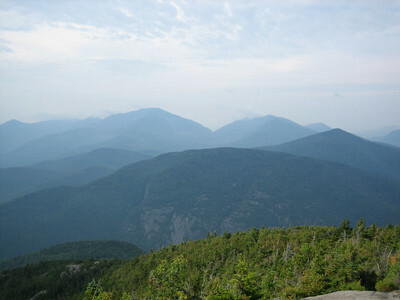 Giant is 12th highest in NY at 4,627'. It was a hazy, humid day with lots of high clouds, so it was hard to get good photos, though it was quite pretty in person. 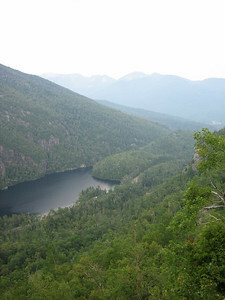 This is from a lookout near the beginning of the hike, overlooking Chapel Pond with the Great Range in the background. Zoomed in on the Lower Great Range. Chapel Pond Slab has some of the longest continuous climbing in the state (7-8 pitches). Chapel Pond and the Great Range from a different lookout. 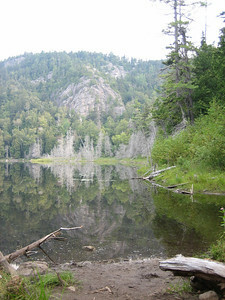 The Giant's Washbowl, a glacially formed pond perched on the side of Giant Mountain. 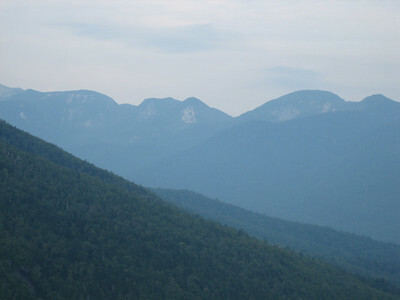 Panorama of the Southern High Peaks. I believe Nippletop, Dial, Colvin, Blake, and possibly the Dix Range are visible, but I'm too lazy to go look at the map. Again, Colvin, Blake, Dial, and Nippletop are all in this area. Sun sun, merciful one. 10 points if you know the song reference. 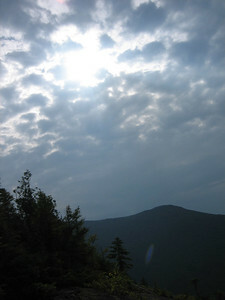 The sun tried to break through about an hour into the hike, and finally did (off and on) later. 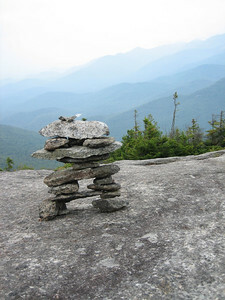 This is clearly no ordinary cairn. This is the undeniable work of a hippy. Most likely barefoot (the barefoot type hippies are the most inclined to balance rocks on top of each other.. apparently it puts them in touch with nature or somesuch). 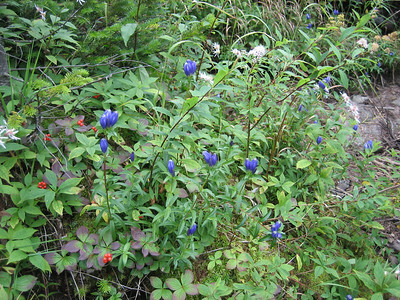 Found some wildflowers at the higher elevations. I'm not sure if "alpine" is truly the proper way to describe it as there's no real tundra to speak of, but there are many plants up here (mosses especially) that are rare and only grow on the highest peaks in NY. 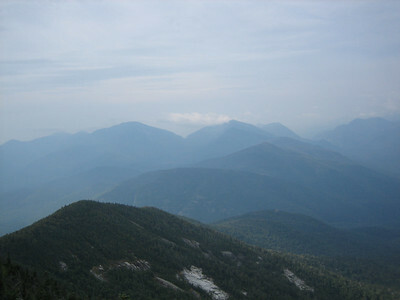 Southern High Peaks from the summit. 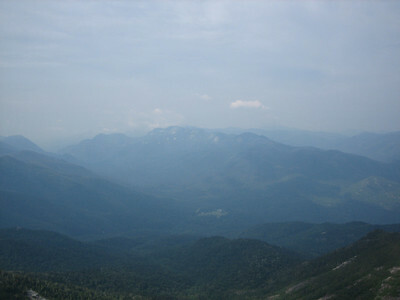 The Great Range from the summit. It was more visible in person, but the camera had a hard time capturing it because of the haze. 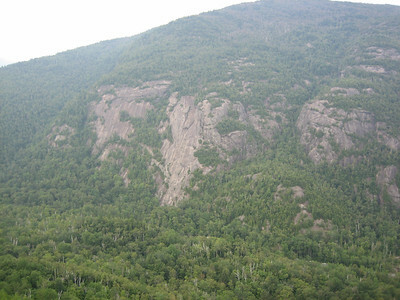 It was good to see that there is finally an effort to curb erosion in the High Peaks. 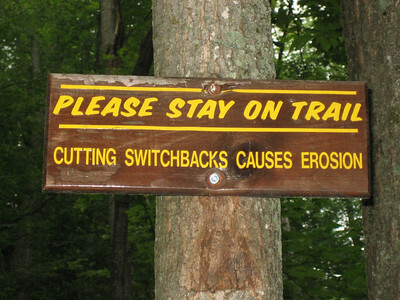 Many of the trails were originally built before the effects of erosion were well understood, and as a result, many are in very bad shape, often eroded all the way down to the bedrock. 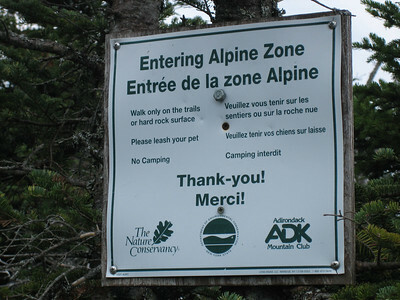 It's good to see an effort to build sustainable trails in the ADKs.